The Enterprise engineering set for ST:TMP, under construction on Paramount’s stage 9. The first one I am making available online for use by fellow Treknologists, Trekkers, molders and film aficionados, is a production sketch produced by Harold Michaelson, the production designer on ST:TMP. 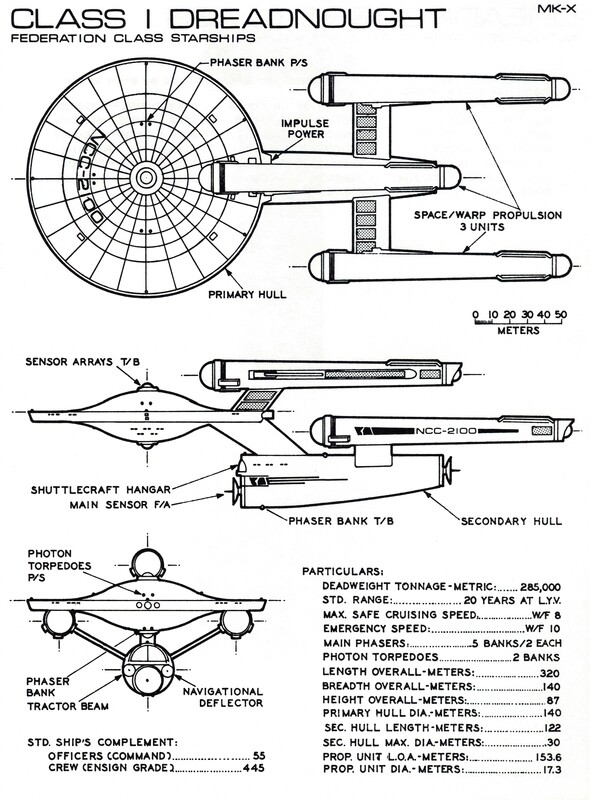 It is a drawing he produced to work out the basic configuration of the live-action set used for the engineering scenes on the Enterprise in the film. It is notable mainly because it shows his initial rough scaling of set pieces for a forced-perspective back portion of the set. This was mainly to create the visuals of the long extended horizontal warp-core that went aft and fed the warp engines themselves. 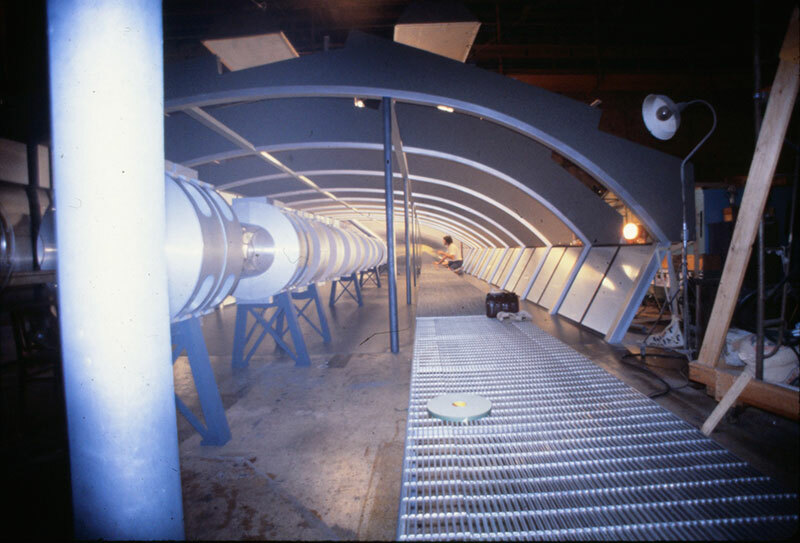 Due to size limitations on Paramount’s Stage 9, where the movie interior sets where built and filmed, the forced-perspective portion of the set created the illusion of the long “tunnel”. Working on the forced perspective set. 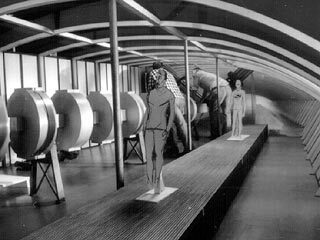 To help sell the illusion when filming, smaller-sized actors where used in the immediate foreground of the raised catwalk section of the set. And further back, they actually used children in smaller sized engineering costumes and helmets. A fellow Trek-geek who I have been doing some collaborative work with was looking for this drawing. He is working on a somewhat related set of drawings for a Dreadnought-class starship, which is a ST:TMP era/style version of a ship first conceived by Franz Joseph for the wildly popular (among Trek geeks) Starfleet Technical Manual back in 1975. I have been helping out a little here and there on his project. Mainly by working out the Enterprise-refit designs. He has also been invaluable in helping spot ST:TMP related production drawings and such when they appear online either for sale or on a fan site. Franz Joseph’s Starfleet Technical Manual. A little over a week ago, he pinged me to catch up and and asked if I had picked up any of the Engineering set drawing(s) at auction back in April. I told him how I had one of them, though somewhat unintentionally since it was by mistake. The Prop Store, the company that had them and a slew of other Star Trek and Star Wars production blueprints up for auction, sent me the wrong piece on one of the items I had bid on and won. At any rate, he was eager to get a look at it, so I went ahead and made that one the first piece I am putting out there for the world to make use of via the internet. So after finally having high-resolution image of the original blue-line print to work with, I took the file and brought it into Adobe Illustrator and digitally “redrew” it. I cleaned up and made the lines consistent, perfectly straight (where the lines were of course intended to be of course) and cleaned up some of the slop in the drawing. This was after all a “sketch” used to work up the basic configuration of the set and wasn’t a finalized or perfected production schematic for set construction. It shows the plan as well as two elevations (side and front-looking aft) of the set. The original high-resolution images from Pearl Printing, the studio that professionally digitized the original drawings, were 350 pixels per inch which is somewhat overkill, and so I will not be publishing those here my blog. That said if for some reason anyone wants to get a hold of the full 350 PPI image, I would be open to doing so by request. Hal Michelson engine room sketch. This omits the “doodles” Mr. Michelson apparently scribbled in the margins, as well as all the aforementioned clean-up of the drawing itself. I will eventually circle back and do a much more through expansion of the engineering section of the Enterprise, when I get to that part of doing the full interior drawing/schematic workup of the ship. These will be done as full orthographic and 3D drawings of “in universe” hyper-detailed plans. But that is a long ways off. I have two other original production drawings I recently acquired of the bridge and B/C deck. One done by Leslie Ekker and the other by Andrew Probert. Once I have those physically in hand and digitized, I will most likely be publishing those next. They will help me in fishing up the Officer’s Lounge drawings as well, since the B/C deck is where the Lounge is within the ship. So working out the hyper-accurate drawings of it, will allow me to work out the ceiling lines, as well and outer walls of the Officer’s Lounge to make it fit within the (“in universe”) of said B/C deck superstructure. I may also revise how I will be making all of these pieces these available if I come up with a better format as an archive repository. But for now accessing via the blog posts will do. Once I have a few more pieces pulled together, I will look into some gallery format, or something along those lines as a new part of the site. Anyway, more on those newer pieces in later posts. This entry was posted in Project Enterprise, Projects and tagged Andrew Probert, blueprints, dreadnought, engineering, Enterprise-refit, Franz Joseph, Harold Michaelson, Leslie Ekker, sets, Technical Manual, warp engine. Bookmark the permalink.